Amongst all the client side frameworks backed by big companies, React.js and Angular.js appear to be the most popular. However, Knockout.js still maintains a good market share, thanks to its interesting peculiarities. Knockout is based on an MVVM paradigm similar to Angular.js, but unlike React.js. While it is adequate for modular complex applications, at the same time, it is very simple to mix with server side templating, similar to React.js, but unlike Angular.js. For this reason, it appears to be better than both React and Angular for building modular complex systems that mix server side techniques (like Razor), with client side techniques. 3) To enhance Razor pages with client side bindings, something difficult to achieve with both Angular.js and React.js. You may run this command in any Windows, Mac, and Linux console. Here choose the template whose short name is “knockout”. Create a folder called “KnockoutDemo” for our project. Then open a console in this directory. In Windows, we can do this by holding down “shift” while right clicking on the newly created folder, and then selecting "open command window here". After that you may open the newly created KnockoutDemo.csproj in Visual Studio 2017. Once all Nuget, and NPM packages have been restored, save the whole solution. It is a Single Page Application with three pages. We will analyze it in the following subsection. When you click a menu link, the content of the browser address bar changes, but the browser doesn’t perform any GET. Link URLs are mapped into knockout.js components by the code in wwwroot\ClientApp\router.ts, that in turn uses Crossroad.js to handle routes (url-components mappings). After that, knockout.js components are retrieved by the custom knockout.js component loader contained in wwwroot\ClientApp\router.ts\webpack-component-loader.ts that in turn relies on webpack 2 loader to communicate with the server. Browser history and address bar are handled by History.js. The app-root component contains the “hole” that hosts the various SPA pages with the appropriate knockout.js bindings. We will analyze it in the next section. 3. The site.css file with the site-specific CSS. Actually, site.css is added only in production and staging. This is done since webpack 2 is configured to add all CSS rules within a style tag during development, so that changes made while the program is running, takes immediate effect thanks to webpack 2 hot module replacement. The way webpack 2 bundles all files is defined into the webpack.config.js and webpack.config.vendor.js configuration files. webpack.config.vendor.js uses the DllPlugin to bundle all needed npm modules as a library that is then referenced by webpack.config.js with the DllReferencePlugin plugin. webpack.config.js specifies how to bundle all js, ts, CSS and images that are specific to the project. It uses the awesome-typescript-loader plugin to compile and load TypeScript according to the compilation configuration contained in tsconfig.json. knockout.js components are bundled in separate files and loaded on demand, thanks to the lazy loading feature of the webpack 2 'bundle-loader!' plugin. Lazy loading is activated by prefixing the file name contained in a “require” with the 'bundle-loader?lazy! When this is done, the call to “require” instead of returning the actual module returns a “load function”, that when called with a callback parameter, triggers the actual module load. In our case, the actual “load function” will be invoked by the webpack-component-loader.ts custom knockout loader that we will look at in the next section. ..in webpack.config.js specifies that CSS should be bundled in the html as in-line style during development, and as a unique minimized file, in all other environments. ..causes all images referenced in CSS files and js/ts files to be inserted in-line if their size is less than 25k, and in other modules, if they exceed that size. In the next section, we will see an example of image bundling. All plugins are referenced in the webpack 2 “plugins” section with further configurations in their constructors. While all application specific source client files are contained in the ClientApp folder, all files bundled by webpack 2 are deployed in wwwroot/dist. The above code invokes webpack 2 with the “hot module replacement” feature. When this feature on webpack 2 detects file changes, it automatically sends the updated modules to the browser, thus enabling the developer to see the effects of any change immediately, with no requirements of refreshing the page or restarting application debugging. In the remainder of the article, we will analyze in detail the “pure SPA” model and how to add more SPA pages and components. Then we will see how to add other Razor Views that use knockout.js components with or without a router, and finally we will mix Razor and knockout.js code in standard views. In this section, we will dive more deep into SPA specific details. The history object passed as a parameter to the app-root component is actually received by the constructor of its ViewModel defined in ClientApp\components\app-root\app-root.ts. It is used to initialize a CrossRoads based router that is defined in router.ts. The remainder of app-root.ts registers all components used by the SPA. When the file is processed, webpack 2 recognizes each lazy loading request and replaces the “require” call with another call. This call instead of returning a ViewModel/template pair, returns a loader function that must be called to download such a pair from the server, the first time the component is invoked. The code above specifies a loadComponent function to be invoked immediately before the component is instantiated. It is passed the component name as first parameter, and a callback, that is called once the component is ready as the last parameter. The second parameter is the load function returned by the “require” call in the component registration. This function is invoked and passed a lambda callback that in turn, is invoked once the component has been successfully downloaded from the server. finally calls knockout.js default loader passing it loadedModule that now contains the actual ViewModel/template pair that defines the required component. app-root template prepares the place to load components that act as SPA pages, invoking the component binding with the component name contained in the current route. This way, when the user clicks a link, a new route becomes the current route, and the component name it contains is passed to the component binding, which in turn causes the component be downloaded from the server and instantiated. The fetch-data component scaffolded by the SPA template shows how a component may get data from an Mvc controller. It interacts with the server with the isomorphic-fetch npm package that is a window. fetch polyfill that works both server side with node.js, as well as on client side. More specifically, it uses whatwg-fetch on client side and node-fetch on server side. "Warm", "Balmy", "Hot", "Sweltering", "Scorching"
While data is being downloaded from the server, the forecasts property is empty, so the “ifnot” binding shows the paragraph content. Finally, when “forecast” observable is filled with data, the “foreach” binding shows the table rows bound to each item properties through the text binding. In this subsection, we will see how to add a new SPA page. As a first step, we need a new component. At the moment, our view model does nothing, since our template contains just static html with no bindings. In the next section, we will add some logic to display an image. So the TypeScript module just exports the view model / template pair. Before using our component, we must register it. The new SPA page is registered with lazy loading like all other pages. Now our new page is working, we just need to link it somehow. The css binding adds the active CSS class whenever the about page is the one currently displayed. Run the project and click the about link. You should see the newly added page. In this subsection, we will add an image to an already existing component, and will see how to bundle it with webpack 2, and how to render it with a knockout binding. Images may be added directly to the wwwroot distribution folder and then referenced in all html files. However, you may do a require from ts files and then attach them to the Dom with the “attr” binding. The main benefit of the second technique is that images may be preprocessed by various webpack 2 plugins. 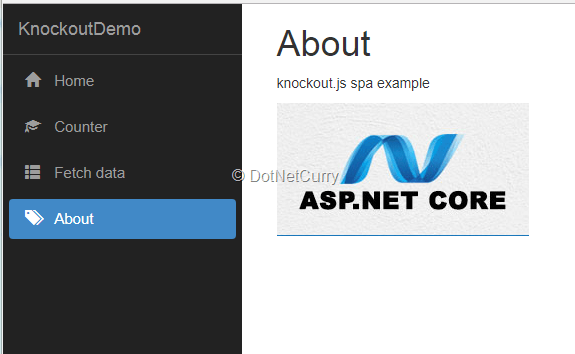 The knockout SPA template comes with the url-loader plugin that puts small images in-line instead of referencing their URLs. However, you may use also plugins for creating responsive images. A standard SPA application usually contains a single Razor view that hosts the whole SPA application, in our case the Index.cshtml. Instead, what if you want to enhance several Razor views with knockout.js components? Some Razor views may act as SPA connected with the browser history and with a router (like the Index.cshtml Razor View), while others may use knockout.js in a different way. Hybrid SPA/Razor pages that mix both server side and SPA techniques offer great flexibility in practical applications because applications based entirely on SPA techniques offer a better interaction with the user but cost more, are more difficult to maintain and have a shorter life since client side techniques evolve very quickly. Therefore, only web applications with a limited usage of SPA techniques and where a higher interaction with the user is necessary, appear quite attractive. In this section, we will show how to build a similar scenario, by adding a new View that accesses the same contents available in the Index.cshtml view, using a bootstrap tab. This code has the purpose of selecting which urls to process with the SPA router and which ones with usual http requests: all relative urls are handled by the SPA router, while complete urls are handled with http requests. At the moment, the content is minimal. We will add the remainder of the code after having verified that everything works properly. First, we need a link to the new page. Run the project and verify that the SPA page and the new page we added, link to each other properly. Before we may add the bootstrap tab with the knockout.js components in its panes in the TabSelector.cshtml view, we must prepare a TypeScript file for that view. In this section, we will use Knockout.js just to enrich the Html generated with usual Razor views and tag helpers. Please note that this is something quite difficult to achieve with other client frameworks like angular and react.js. The above code contains label, input and validation tag helpers. The input tag helper also contains a knockout.js binding to mirror everything the user writes in a paragraph. A form encloses the input field, so that the user may submit its input to the post version of the KnockoutMvc action method. We will see that both Mvc features and Razor/Mvc features works properly and complement each other. In particular, the label will show the content of the server side ViewModel Display attribute, and the input will be required because of the RequiredAttribute added to the ViewModel SimpleText property. The view references the mvc.js bundle that starts knockout.js and references the needed vendor.js library modules. We may create it as we did in the previous section. The code is quite simple. Run the project and verify that both, form submission, validation (submit the empty input), and knockout.js work properly. We showed how Knockout offers a great degree of flexibility and cooperation with other frameworks. 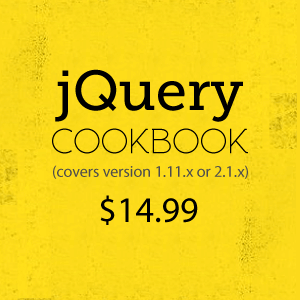 It may be used to implement a standard SPA with the help of History.js and CrossRoad.js, but it may also be used in mixed solutions where knockout.js components and bindings, along with other frameworks like bootstrap.js are used in standard Mvc pages that are part of a mixed SPA/MVC application. This article was technically reviewed by Daniel Jimenez Garcia.